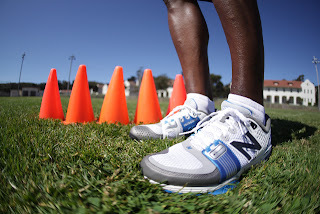 shopnewbalance.com: Boot camp is no match for this trainer: The New Balance 871. Boot camp is no match for this trainer: The New Balance 871. The inventor of the cross-training category has done it again. Designed to tackle the toughest boot camps, the New Balance 871 cross trainer raises the bar in versatility. Wear it to the gym, outdoors, for walking or weight lifting. It performs equally well wherever you need it. The secret is the technology that’s built into this sleek, stylish package. New Balance has loaded up this shoe with its premier cushioning material, N-ERGY®, to provide superior shock absorption. Combined with ActevaTM cushioning in the heel, it delivers a smooth ride and easy transition from move to move. To keep up with the quick side-to-side movements demanded by most fitness classes, the New Balance 871 features a lateral outrigger for the ultimate in stability. The rugged outsole is outdoor-inspired to provide excellent traction on a variety of surfaces, both indoors and out. Plus, its low-profile design provides superior ground contact. For a shoe that boasts so much technology, it is surprisingly lightweight. The New Balance 871 won’t slow you down. The strategically designed upper eliminates the material, and therefore weight, you don’t need. The result is a fit that feels like a glove and provides support where it is needed most. Shape magazine recently named the New Balance 871 "Best for Fitness Classes" and it’s easy to see why. Put it to the test for yourself. The New Balance 871 is ready for boot camp. Are you?